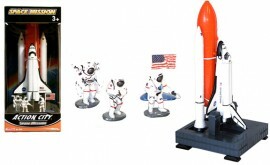 Space Shuttle Launcher (9101) - spacekids - space toys, dressing up costumes, kids spacesuits, astronaut food, cool space stuff! A great playset featuring a diecast model of the Discovery space shuttle, with opening cargo bay doors. The set also includes the launcher assembly of fuel tank and booster rockets measuring 30 cm (12”), 3 astronaut figures and US flag.